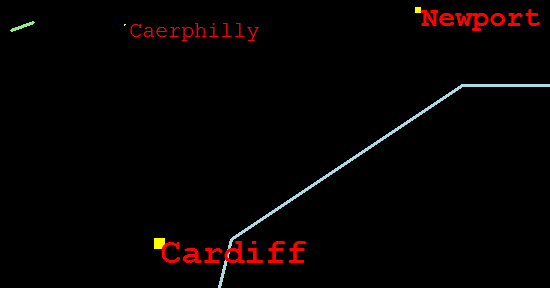 You can use program FlyingUK, now available here as a web version, to improve your knowledge of the relative positions of towns and cities in Wales and most of England. The flying speed depends on the distance from cursor to the plane (represented by a line), so you can use your mouse to control both the speed and direction of the plane. The following screen shot shows program FlyingUK in action. The prefix code code (no prefix, a or b) represents size the of the place. The code governs the mark (point, small square or larger square) and font for the name on the map representing the place. Peter generated the points for coast and for towns automatically by clicking on a map in a support program. You need to add the text file places.txt to the program folder. Download data file places.txt. In order to run program FlyingUK, you will need to have downloaded also Stefan Berinde`s wingraph.zip file as described in our Graphics tutorial. You should copy the unzipped wincrt.pas, wingraph.pas and winmouse.pas (from the src folder) into your program folder. (The compiled units are included in the zip file but you might as well have the source code available for reference). You should find these three files useful for your own motion graphics programs. How quickly can you fly over Bridlington, Sheffield, Manchester, Wrexham then Southampton? Can you find Hessle? Could you write a program using wincrt, wingraph and winmouse?